I thought I would make a thread where I could share projects I have been working on , some might not be worthy of their own thread. A wile back I posted a chair I made. I was asked about the tools I used so I made a table with a few more pic's. My main focus was trying different joints, seeing what worked best. Some of the wood split as I was building it. Cut and carve the dowel to fit. The dowels for the top I cut oval shaped so I could rotate them & lock the top on tighter. It was more work then I thought it would be, ( at least it will hold my beer) but I did learn a few thing about what works best. Actually I think smaller projects like the table are more work then a larger one might be. The tools are not something I would carry all the time in the woods but if I had a base camp I think they might be worth it. That turned out great looking! I agree with you on how smaller projects can sometimes be more work. Great job on building the chair and table- I've often thought it would be something I could do if needed, but have never actually pushed myself to the point of actually doing it. Splitting the wood, making notches, boring holes, lining things up...all sound easy until it actually has to work long term. I'm curious what is the tool with the loop that holds your drill bits? Not sure I've seen that before, but looks handy!! You done good. I love Rolling Rock. The eye auger was made with a adapter like this. Mine was 3/8" then I took a eye bolt cut the threads off & ground it square. I think it is a little large and the 1/4" one would work just as well. In addition be smaller and lighter. I have 3/8" & 5/8" bits but their are all sizes. The DeWalt side strike chisel worked good for cutting / cleaning notches. I wish they made one without the serrations maybe 3/4". It makes a serviceable fro also. I wish they made one without the serrations maybe 3/4". It makes a serviceable fro also. looks like I have to start over. I forgot to mention some of the pegs were split before setting them. Then I pounded in a wedge ( like you would with a axe) to make them hold tighter. thanks for filling in the how to for your eye bolt T handle. okay, so i gotta ask... why did you attach your chair slats to the outside where your weight leaning back can push the dowels out? I thought about it but did it anyway. The pegs were set at a angle to help prevent it . The chair and table sit next to my fire pit. They fall apart they will go in the fire. I learned a few things about how I could improve any further projects. I kind of want to get some bigger stuff and make a tower or platform, but I don't know what I would use it for. How about your very own shot tower? Be careful, falling can hurt for a long time; not to mention being impaled-done that too. Those back slats would be a good spot for sliding dovetail from the try stick challenge. That table looks great! I love rustic furniture like that. I have a tenon cutter and forstner bit that I got to make stuff like this but it seems like some other project always gets in the way. Very cool, anyhow. My uncle who I owe a lot of my love of hunting & camping to had some "work" done. He is home & doing well but had a little trouble getting around. We went over to see him & I saw a wood cane, Pine I think. It was light a little short for him and not very sturdy. He picked it at some gift shop. 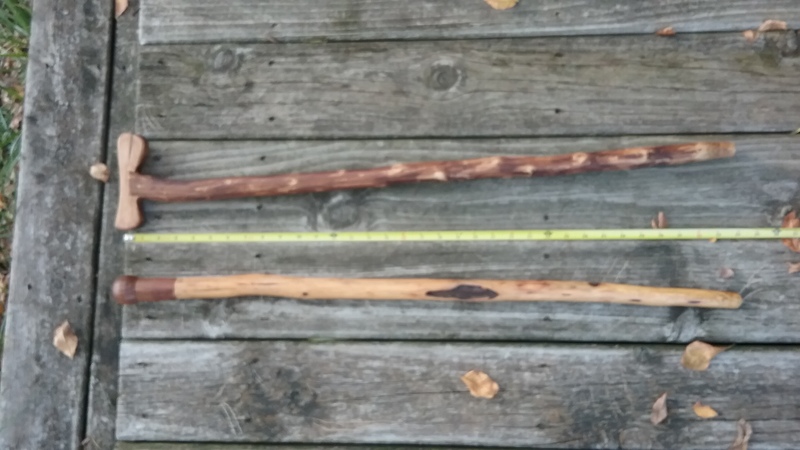 I got to thinking and used a Hickory hiking stick we picked up in Oklahoma this summer to make him a sturdy cane just his size. I gave it to him without taking and pictures. My wife asked me to make one for her father. Fine my me I had fun making the first one & was looking forward to trying out some different things. Tonight we took it over to him & I almost forgot to take a picture of it. This one is Locust from a branch that fell off a tree. Hard wood. You cant tell but I split the shaft and drove a wedge in just like you would with a axe. I have some Osage drying & want to make a few more. I want to try Cedar, Oak & maple. Hey, nice work, lgm! He ought to like that one.....I know I would. The one I was using after hip surgery was one of those 'soulless' adjustable aluminum jobs that you see in the hospital waiting rooms. That is a nice one lgm, it looks like a cane someone would want to use. I use them from time to time when my knees are bad (like after doing some hard work) and find that something like you made, adjusted to the users particular geometry, is really outstanding. And, as Wolfy points out, its nice to have stuff with "soul". It just makes you feel better. Thanks, I had some fun making them & plan to make more. Not sure what I am going to do with them . If someone wants one I would send it for just the cost of shipping. if not I will make em anyway. I hope your uncle is doing well, and the cane helps him get around. It looks cool. With that warhammer head he could take care of business if anyone gave him some gruff. Thanks, I saw my uncle today, He is doing very well. Also my mother & aunt asked me to make them canes. I have wood drying in the garage. I have been wanting to try a dangler sheath. When I carry a side arm I carry my knife on my Left side & a dangler makes it a little easer to cross draw. I made this from a little bit of Kydex. Does this knife make my but look big? Also I have been modding some Old Hickory knives, just for fun. I think I have the knife modding thing out of my system for now. I'd like to hear more about how you made the belt clip in particular. I have been wanting to make some belt clips out of kydex for an IWB holster. I remember seeing a picture a long time ago where they took a piece of wood slightly larger than a belt, and wrapped the hot kydex around it and pressed it, then cut off individual loops from the shape that was formed. The little loop for the 550 cord looks tricky to accomplish. That is basically how I did it, I used a piece of aluminum I had & used a drill bit for the small one. I had to open it up a little so I could insert/remove the para cord with out to much trouble & still not worry about it coming out on it's own. I could'a used one of those last winter instead of that ugly aluminum sucker! I picked up a Chronograph. I have a give card and it was on sale. I like it so far. So many things I want to graph. To day my son & I shot some .22 & I put a few rounds through my S&W 642. I will post the .38 special. I was using factory Remington's 125 gr. +P , they were faster then I thought. If anyone has questions or wants to see the .22 results let me know. I think the app the chrono uses is very nice. I made a little wood box to hold my woods project tools. Looks like a SENSIBLE sized one.......I can't even lift mine anymore. The orange one I made about two years ago. It lives in my hunting pack . I can cut wood, bone, metal, fits any 6" reciprocating saw blade or hack saw blade. Also I can put a stick in the handle for more reach. 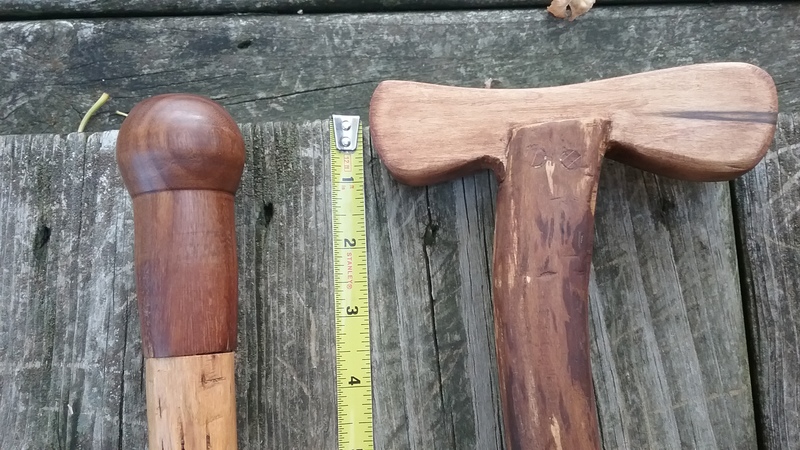 The large one is a Fiskers pole saw replacement blade I found on sale for $7.50 so I bought it & made a handle from Oak. I really like the pole saw bladed saw.......those things EAT wood! Good ideas, lgm! I just finished this one Osage shaft & Ash handle. The Ash is from storm damage. The shaft is about 1" thick. Nice & sturdy. Very nice! 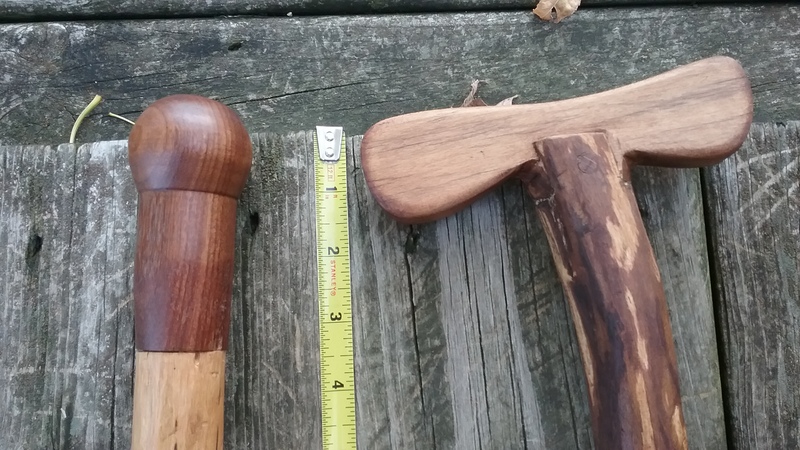 Looks like it would not only make a nice walkin' stick, but a great 'head-bonker,' putter or croquet mallet, too! Had not heard Redbone in a long time. Thank you, not sure what I am going to do with the canes but I enjoy making them. I might be interested in buying one of them. Send me a PM with what you would want for one and I will measure up one of my existing ones to see how long it has to be. I am getting both knees replaced shortly and will use one for a few months after I suppose. All I would ask is cost of shipping. If you want I can post pictures & size of the ones I have. 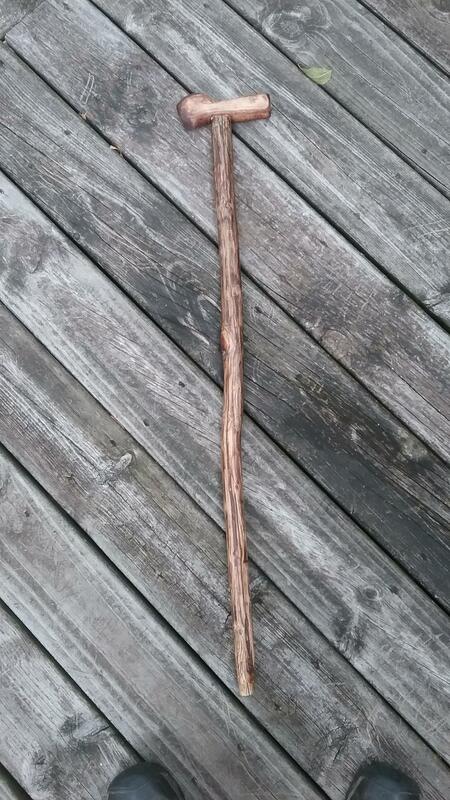 Neat walking stick. I like the wedge, just like an axe handle. Yes, please post the photos. I would need a shaft that is 32" long. Thanks lgm. The bottom one is cedar & walnut . 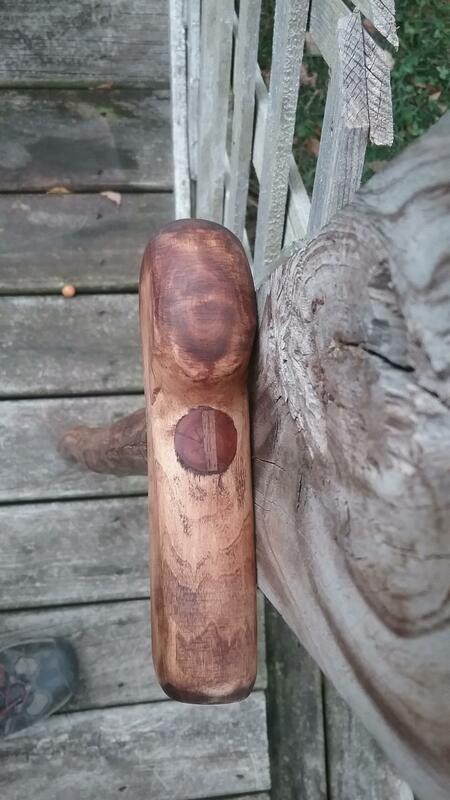 I thinned the shaft to I think 3/4" & inserted it into the handle about 1"-1.5"
The top one has a maple handle . Sorry I don't know what wood the shsft is but I wish I did, I would get more. It is hard & has some flex .It is hard to see but it is pinned on with 2 1/4" oak dowels.